Perhaps the most honored female athlete in the annals of Lowell High School, Jennifer Burns Martin achieved significant honors at the local, state and national levels while leading the Red and Gray Swim team to the most successful period in history. 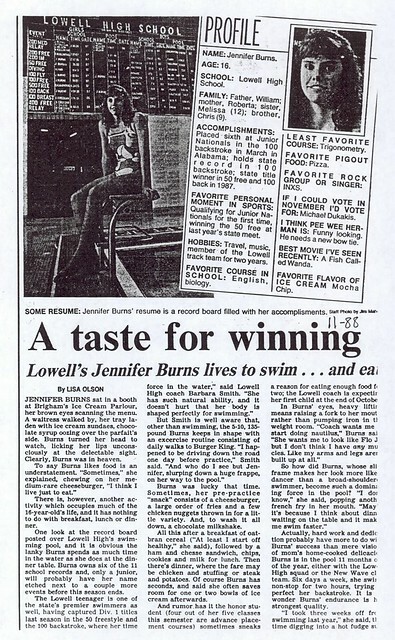 Prior to her entrance into Lowell High School (and throughout her attendance there), Jennifer competed for the Lowell High-based New Wave Swim Club. She competed at the Junior National and Junior Olympic Championships highlighted by a 6th place finish in the 100-meter backstroke at the Junior Olympics in Fort Lauderdale, Florida. Among her most treasured victories was a defeat of current 5-time Olympic Gold Medal winner Jenny Thompson in a New England Championship meet. 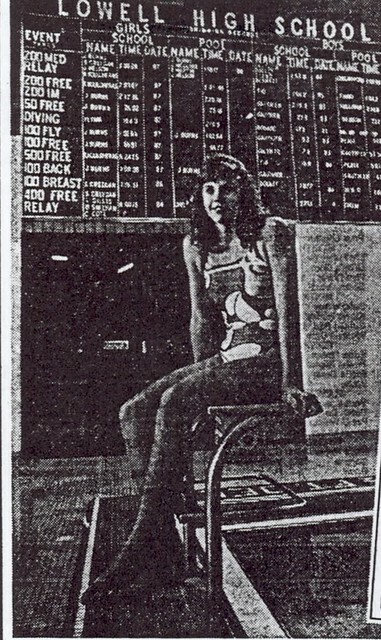 As a member of Coach Barbara Smith’s Lowell High Swim team in the late 1980’s, Jennifer left an indelible mark on the school’s record book, one that might never be equaled. A 4-time team MVP and Lowell Sun All-Star (3-time Sun Swimmer of the Year), Jennifer also earned Merrimack Valley All-Conference honors 4 consecutive years. 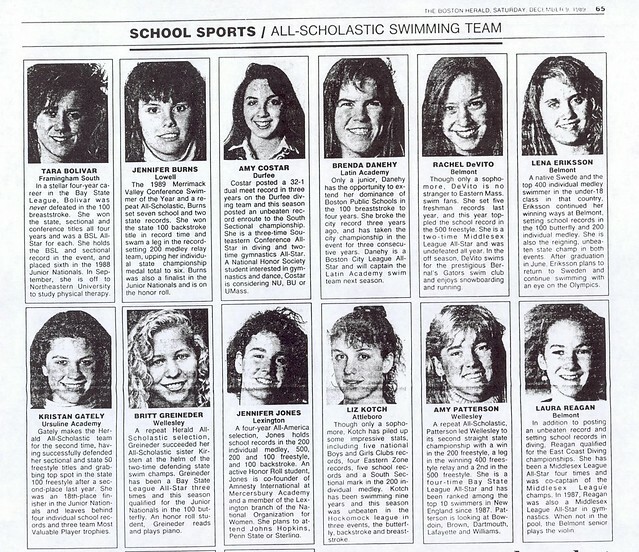 At her best in championship meets, Jennifer was a 6-time Massachusetts State Champion, including 3 consecutive 100-yard backstroke titles (1987–1989) and 2 consecutive titles as a member of the LHS 200-yard medley relay squad–with teammates Ellen Martin, Julie McGuirk, and Kara Kouloheras (1988–1989). During her senior season (1989) Jen, the Red Raider Captain, led the Raiders to MVC and North Sectional Championships (ending powerhouse Acton-­Boxboro’s 8-year reign in the latter). Additionally, Jen set a Massachusetts State Record in the 100 backstroke and sparked the 200 medley relay team to a State Record as well. The 3-time Boston Globe and Boston Herald All-Scholastic received the prestigious Lowell High School Athletic Valedictory Award in 1990. 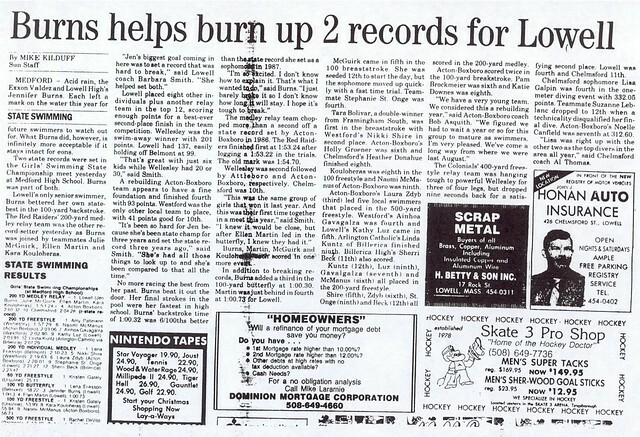 Upon graduation, Jen held no fewer than 7 Lowell High School Records. 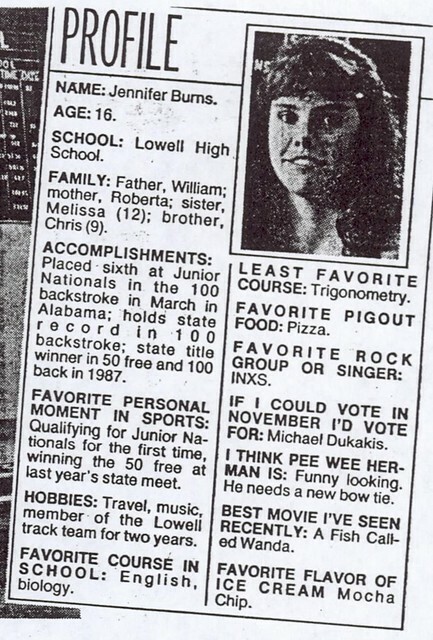 Jennifer also was a member of the Lowell High School Eastern Mass Class A State Champion Outdoor Track team in 1987. Upon graduation, Jennifer received a swim scholarship to the University of Pittsburgh, where she continued her natatorial exploits. 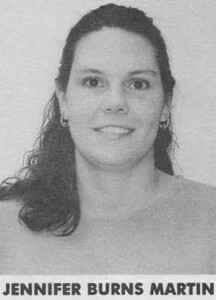 A 4-time All Big East Conference selection, Jennifer was Pittsburgh team Captain during the 1993–1994 season. She was the Panthers’ leading point scorer at the Big East Championships during that season and a member of Pitt’s Big East Championship 400-meter freestyle relay team. Jennifer was selected as a member of the Big East Athletic Directors Honors List of Academic Achievement for her combined academic and athletic excellence. In 1994, Jennifer was chosen as winner of the Blue Gold Award presented to one senior woman (from all sports) for athletic achievement, academic excellence, leadership, and dedication to the University. In recognition of this prestigious honor, Jennifer’s name is now inscribed in stone in the Varsity Walk along with past honorees, such as Olympians Sue Heon and Roger Kingdom, NFL Hall of Famers Mike Ditka and Tony Dorsett, and ex-Miami Dolphins QB Dan Marino. 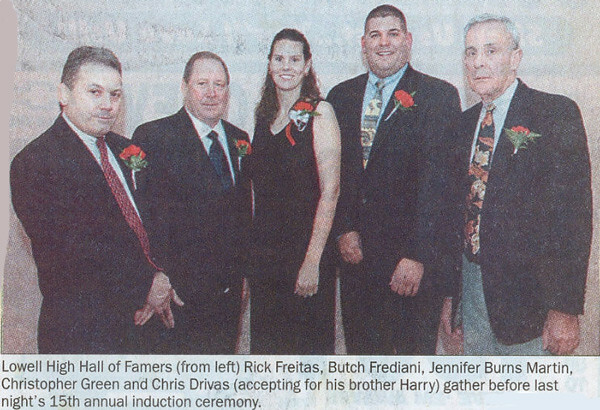 Jennifer’s sister Melissa Burns Botto was also inducted into the LHS Hall of Fame in 2006, and her brother Christopher W. Burns was inducted in 2014.